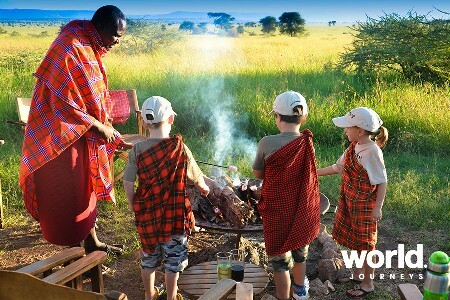 This once-in-a-lifetime journey is for those who want to experience the best of Kenya and Tanzania in luxury and style. Visit the wilderness hotspots of the Masai Mara, Serengeti National Park and Ngorongoro Crater. You will enjoy the stunning contrasts of these destinations and encounter a myriad of wildlife on twice daily game drives. 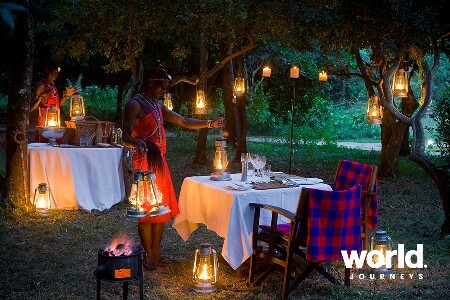 Stay at our hand-picked exclusive safari camps, flying between to maximise your time on safari. You'll be treated to exceptional cuisine and impeccable service - you may never want to leave! A Zanzibar extension to flop on the beach for a few days is an ideal optional add-on (additional cost). 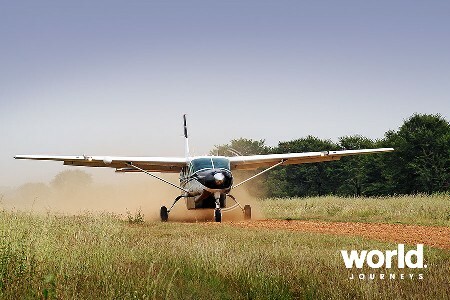 Day 1: Nairobi > Masai Mara Short flight from Nairobi to the renowned Masai Mara, where you will spend two nights at andBeyond Bateleur Camp. 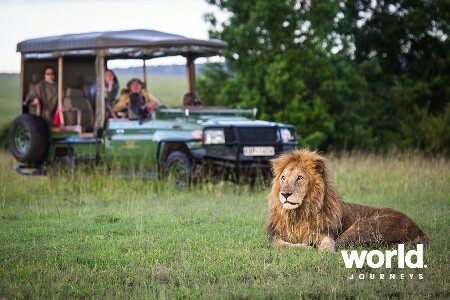 Day 2: Masai Mara Game Reserve Morning and afternoon game drives with expert guides with the greatest concentration of wildlife anywhere. 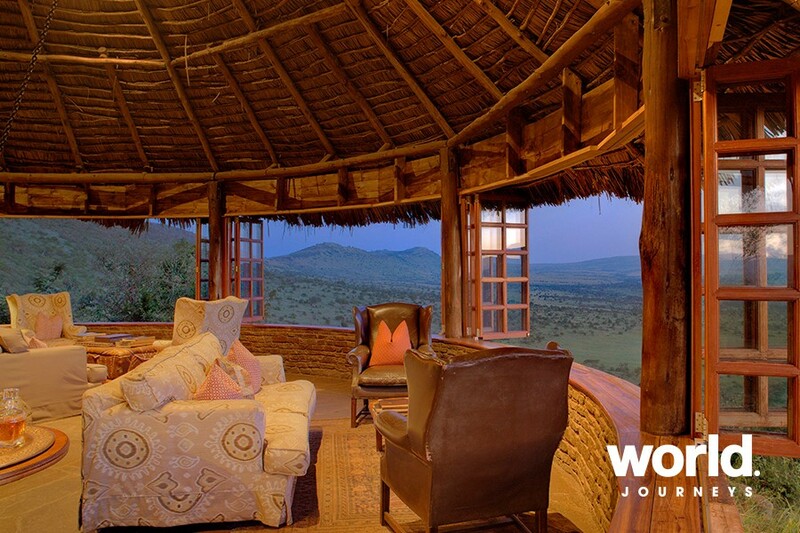 Uninterrupted views of the Mara from the pool or lounge area at camp. Day 3: Masai Mara > Serengeti National Park Fly to the Serengeti for three nights at one of the unique andBeyond camps: Grumeti Serengeti Tented Camp, Klein's Camp or Serengeti Under Canvas. 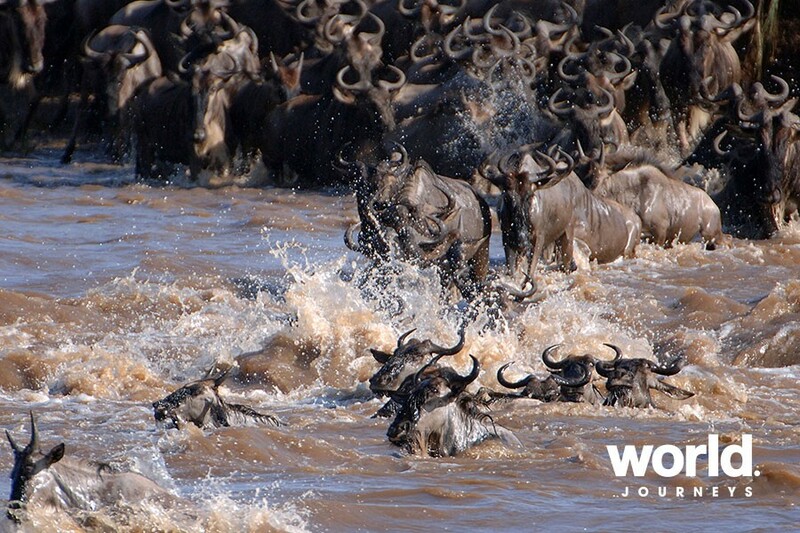 The Serengeti is home to the most spectacular wildlife migration on earth - called the Great Migration. We will place you in the right place for the right time. 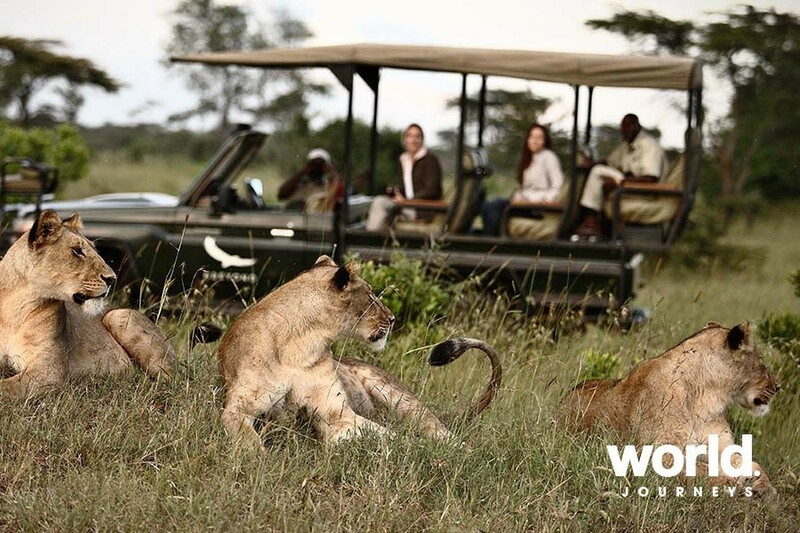 Days 4 & 5: Serengeti National Park Embark from camp on morning and afternoon (or full day) game drives. 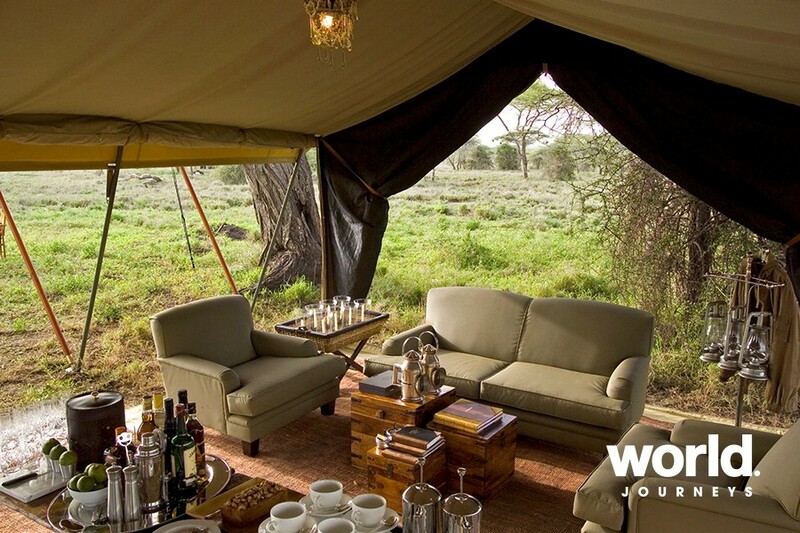 Each camp is perfectly positioned during certain months to witness the migration and also resident wildlife. 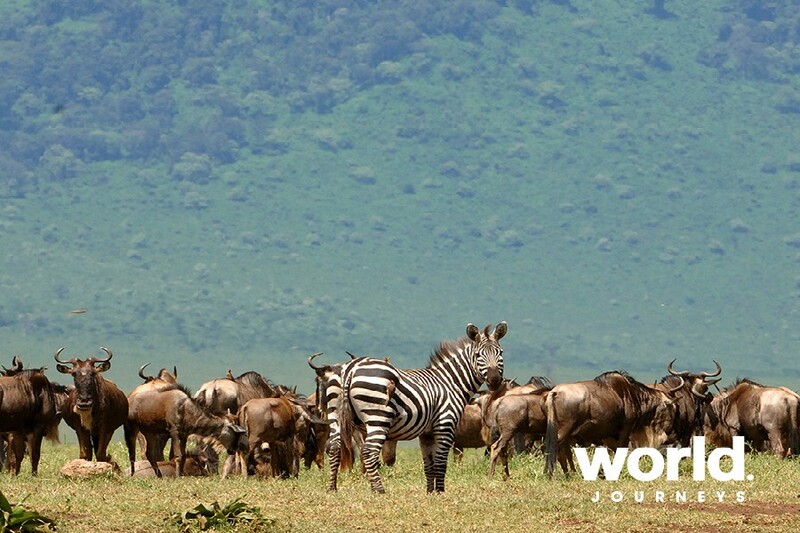 Spend the days in search of wildebeest, zebra, antelope and the predators that follow. 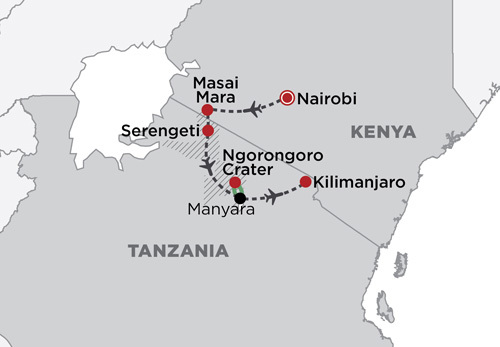 Day 6: Serengeti > Ngorongoro Crater Fly to Manyara and drive to the Ngorongoro Crater. 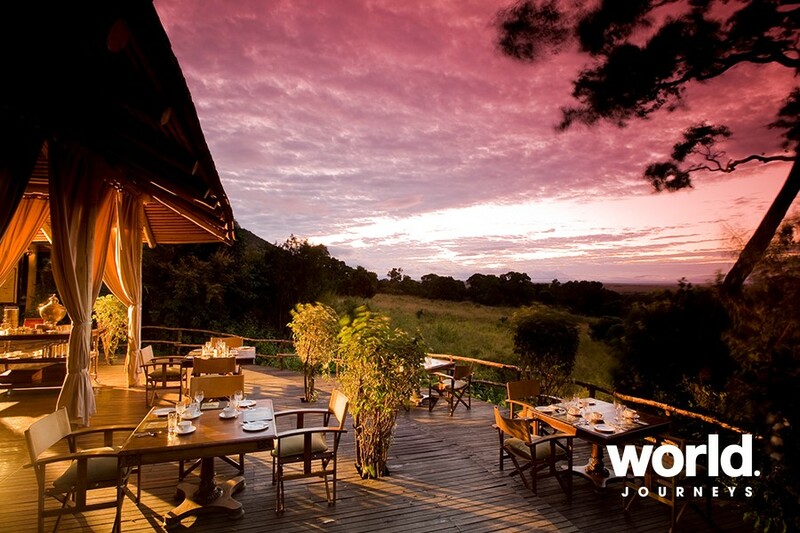 Spend two nights at the distinctive andBeyond Ngorongoro Crater Lodge. 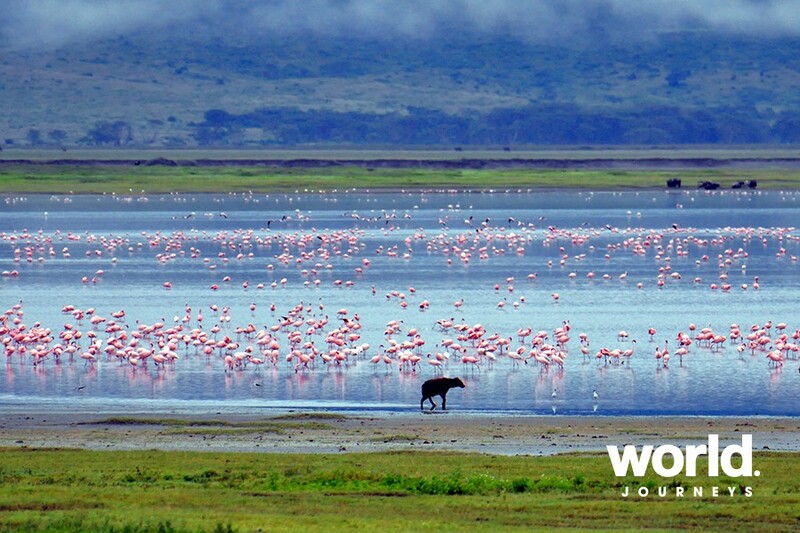 Day 7: Ngorongoro Crater Spend a full day in the Crater, an ancient volcano sheltering more than 30,000 protected animals. 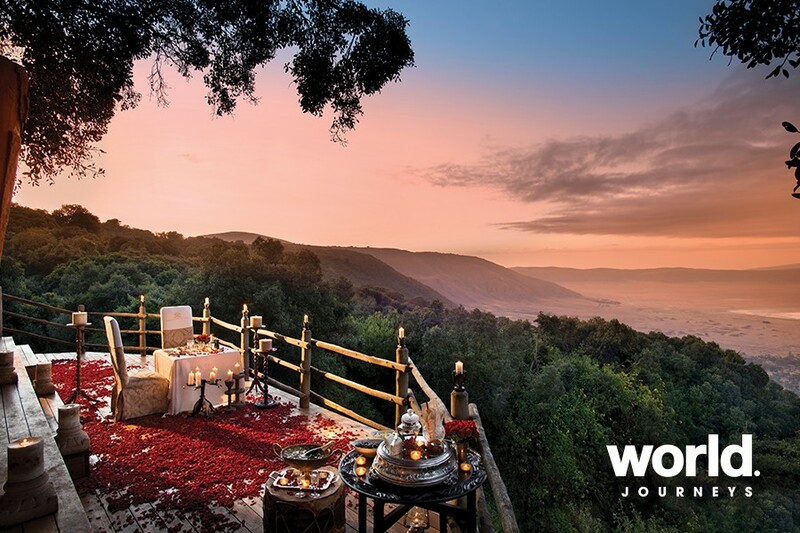 By night, enjoy sundowners on the crater rim followed by dinner in the formal dining room and perhaps a spa treatment or bath to round out the day. Day 8: Ngorongoro Crater > Manyara > Kilimanjaro or Zanzibar Transfer to the Manyara Airport for your flight to Kilimanjaro or Zanzibar. Connect to your onward international flights. Optional Zanzibar Extension: Day 8: Ngorongoro > Zanzibar Fly from Manyara to Zanzibar Island via Arusha. You will quite possibly get astounding views of Kilimanjaro as you fly by! 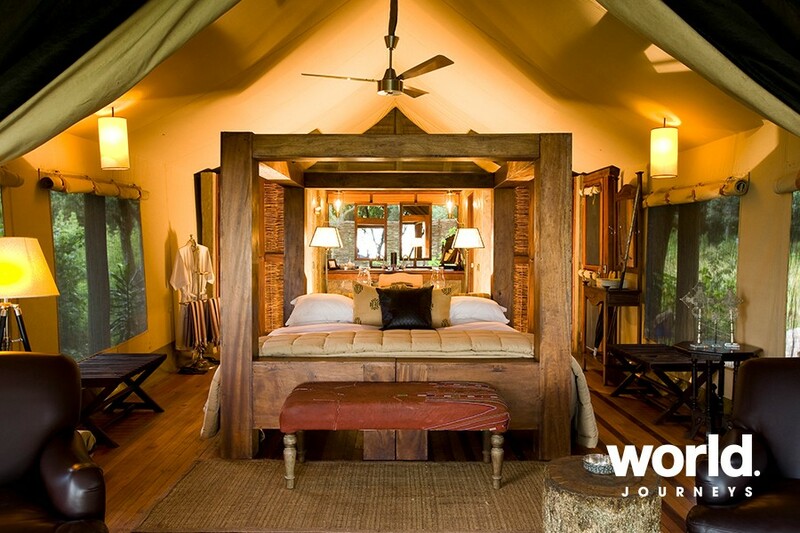 Transfer and spend three nights relaxing at your chosen hotel or resort. Days 9 & 10: Zanzibar Days at leisure. 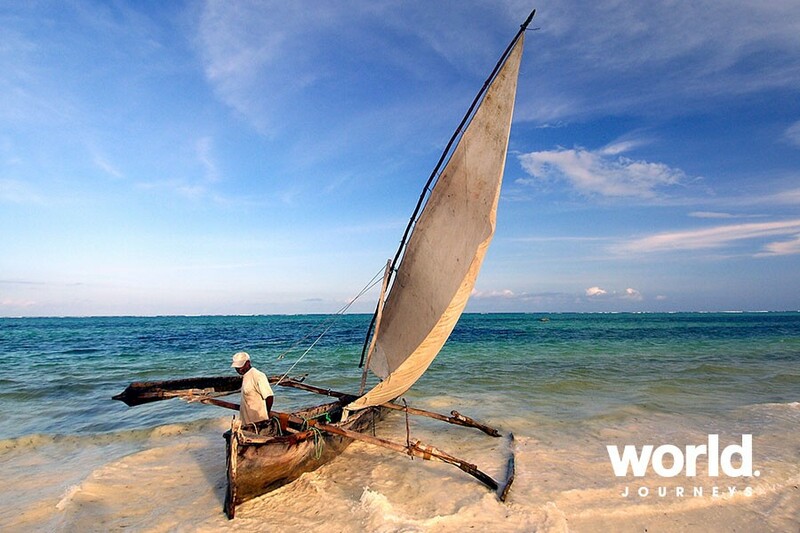 Staying at a Zanzibarian beach resort gives you flexibility to do as you like - whether that be lots of activity - scuba diving, snorkelling, fishing and sailing - or do as little as you please. The markets and old Stone Town are a must during your stay and will definitely indulge your "culture-vulture"! Day 11: Zanzibar Transfer to the airport for your onward flights. • Pricing is for travel within the specified dates. Should travel cross into two different seasons a reprice will be given for actual dates. 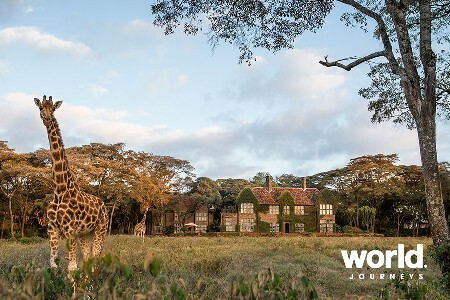 • Maximum of four lodges per itinerary • A minimum of two guests in low season • Flight routing for packages that combine Kenya and Tanzania only as follows: Kilimanjaro - Manyara - Serengeti - Kilimanjaro (and reverse) or Kilimanjaro - Manyara - Serengeti - Mara - Wilson - Jomo Kenyatta International Airport by road (and reverse) • Internal Tanzanian routings can be rearranged • Flights on packages that combine Kenya and Tanzania will be routed via Tarime and Migori in peak season and via Wilson in low demand seasons, depending on passenger numbers and at the discretion of the air charter company. Subject to availability. • Child rates apply for children aged between 6 - 16 years sharing with 2 adults. 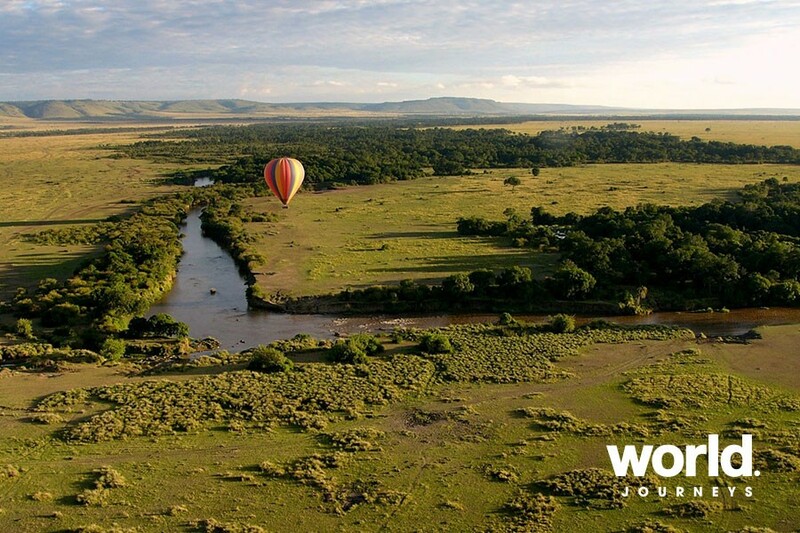 We highly recommend adding: • a Balloon Safari over the Masai Mara or Serengeti - please enquire for prices. 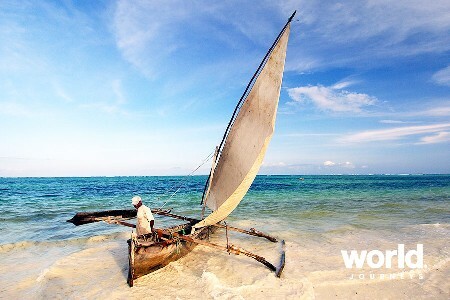 • an extension to Zanzibar - see our Zanzibar package and enquire for prices. National Park Fees and Airport Taxes are not included and will be added at the current rates (subject to change). Current park fees (variable) per person, per day: Masai Mara US$80; Serengeti US$71 - 130; Ngorongoro Crater US$215; Lake Manyara US$102.